“John Carter of Mars,” the series of novels, holds the claim of inspiring James Cameron to create “Avatar.” The film “John Carter,” however, does not have the claim of inspiring anything, and it is not very inspiring by itself. The film begins in the Western United States where John Carter, played by Taylor Kitsch, is trying to live out his remaining days after the Civil War in peace and searching for gold; however, he is captured by the US Cavalry because of his exemplary service in the Confederate Army, and they need someone to help fight the Apache Indians. Carter runs into the Apache and in his attempted escape he happens upon a cave which transports him to Mars. Upon reaching Mars, Carter is taken captive by green aliens known as Tharks and, thanks to his newfound strength and agility due to Mars’ reduced gravitational pull, wins their admiration and trust. Carter then meets the beautiful princess, Dejah Thoris of Helium, played by Lynn Collins, as a result of the ongoing war between Helium and Zodanga. Each of these city-states vies for power over the dying Martian world, but Zodanga has the advantage due to a mysterious supernatural technology. John Carter’s goal is to save Helium, the Tharks, and win the love of the princess. “John Carter” is very much a western. It starts in the traditional western setting but even after Carter’s journey to Mars it stays in the same genre. 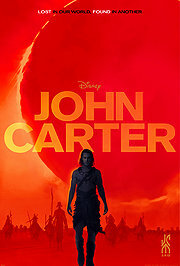 “John Carter” seems to be very much from the same stock of “sci-fi westerns” like “Avatar” and “Star Wars.” While it may come from the same background though, it comes across as less interesting overall. To sum up: is “John Carter” a well-made sci-fi western? Yes. Will it gain the voracious fandom of other much loved staples of the genre? No. And judging by its weak performance at the box office, I would place my bets that we won’t be seeing a sequel.